Dr. Ernest Cole of the Hope College English faculty is co-editor of the book “Emerging Perspectives on Syl Cheney-Coker,” who is regarded as Sierra Leone’s leading writer. The publication, released earlier this fall by Africa World Press of Trenton, New Jersey, bookends nicely on both personal and professional levels with some of Cole’s earlier scholarship. As a young graduate student at Fourah Bay College in Sierra Leone in 1994, Cole had written a paper about the poet and novelist that he was invited to present during a gathering at the American Embassy. The audience included someone unexpected. Both men subsequently left Sierra Leone during the nation’s civil war, which lasted from 1991 to 2002, eventually pursuing academic careers in different parts of the United States. Although Cole continued his scholarly interest in Cheney-Coker’s work, and they stayed in touch, including for an interview Cole conducted with Cheney-Coker for the book, they didn’t meet in person again until earlier this month, when Cheney-Coker visited Hope as the featured speaker in this year’s DeGraaf Lecture Series. “I didn’t see him again until I picked him up at the Grand Rapids airport on the 4th of September, 2014, 20 years after I’d first met him,” Cole said. As it happened, the address the next day took place on the same day that Cole received the first copies of “Emerging Perspectives on Syl Cheney-Coker” in the mail. Cheney-Coker has published four collections of poetry and a novel, which won the 1991 Commonwealth Writers Prize, Africa Region. He has also received the Fonlon-Nichols Award from the African Literature Association. Born in Freetown, Sierra Leone in 1945, he studied at the University of Wisconsin-Madison and the University of Oregon. He has taught at universities in the Philippines, Nigeria and Las Vegas, Nevada, and was a fellow at the University of Iowa International Writing Program. Cole co-edited the book with Dr. Eustace Palmer, who was his mentor while Cole was doing graduate work at Fourah Bay College. The contributors include scholars from Africa, Europe, Latin America and the United States. The book is organized into three sections: interviews with Cheney-Coker, discussion of his poetry and discussion of his prose. In addition to his role as co-editor, Cole’s contributions include his June 2012 interview with Cheney-Coker and two essays about the writer’s poetry. 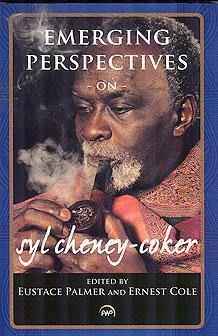 “Emerging Perspectives on Syl Cheney-Coker” is the second book by Cole published in recent months. His book “Theorizing the Disfigured Body: Mutilation, Amputation, and Disability Culture in Post-Conflict Sierra Leone,” which explores the practice and aftermath of punitive amputation during the 1991-2002 war, was published earlier this year, also by Africa World Press. Cole completed his bachelor’s and master’s degrees in Sierra Leone, and began his career conducting research and teaching English at Fourah Bay College. During the civil war, he left for The Gambia, where he taught at The Gambia College for a number of years. He subsequently pursued a doctorate at the University of Connecticut; he completed the degree in 2008, the same year that he joined the Hope faculty. In 2012, he was one of 15 scholars nationwide chosen to participate in that year’s Lilly Fellows Program Summer Seminar for College and University Teachers, “Teaching Peace and Reconciliation: Theory and Practice in Northern Ireland.” Hope named him a “Towsley Research Scholar” in 2011 in support of his research. He discussed his work during the college’s Winter Happening event in February 2011, presenting the seminar “Negotiating Amputation, Forgiveness and Reconciliation,” and was among the presenters during the college’s Critical Issues Symposium in 2012 (co-presenting “Contested Memory, Contested Narratives: The Dynamics of Reconciliation in Post(? )-Conflict Societies”) and 2014 (discussing “Reflection, Reformulation, and Re-Invention: Digital Storytelling and the Dignity of Dying”). Paperback copies of “Emerging Perspectives on Syl Cheney-Coker” are available for $34.95 at the college’s Hope-Geneva Bookstore. The Hope-Geneva Bookstore is located on the ground level of the DeWitt Center, 141 E. 12th St., and can be called at 800-946-4673 or (616) 395-7833 or emailed at bookstore@hope.edu. The final presentation of the Hope College Theatre production “End Days” is tonight in the DeWitt Center main theatre.